Mariner East opponents are trying one last time, with a Hail Mary pass attempt, to stop pipeline development with the aid of Clean Air Council friends. Seven antis from Greater Philadelphia, with money and lawyers from Big Green groups backing them, on Monday asked the Pennsylvania Public Utility Commission to shut down Mariner East 1 pipeline (which has operating for more than a year), and to block the startup of Mariner East 2 pipeline. The chutzpah of these people is breathtaking. To put it in perspective, Chester and Delaware Counties, which is where the seven antis hail from, has a combined population of 1,083,989 people (as of 2017). Seven people represents .0006% of the population. Meaning 99.999% of the population either don’t care, or are not against these pipeline projects. Both ME1 and ME2 carry natural gas liquids (NGLs)–meaning ethane and propane–from the western side of PA across the state to Delaware County and the Marcus Hook refinery. From the very beginning there have been a committed few (with the help of Big Green) fighting the ME2 project every inch of the way. Seven residents of Chester and Delaware Counties are asking the Pennsylvania Public Utility Commission to stop Sunoco operating its controversial Mariner East pipelines, saying the company has failed to give the public enough information about what to do in the event of a leak of volatile natural gas liquids. The residents filed a petition for emergency relief on Monday, seeking to immediately shut down Mariner East 1, which is already carrying NGLs, and to block the startup of a new pipeline that the company calls the Mariner East 2, and plans to begin operating by the end of this year. The emergency petition urges the PUC to stop operations of both pipelines until it holds a hearing on the matter. An accompanying “Notice to Defend” asks the PUC to permanently prevent operation of the pipelines, saying the project violates three state laws on the safe operation of utilities, and arguing that the PUC has a legal obligation to ensure pipeline safety. The complainants argue that the new pipelines threaten public safety because of the highly explosive nature of the materials they will carry, and that Sunoco has not adequately warned the public on how to respond to any escape of NGLs. They use the term “workaround pipeline” to refer to Sunoco’s current Mariner East 2 line, which will consist of sections of 20-inch and 16-inch pipe plus a temporarily repurposed 12-inch pipe. The 12-inch line was built in the 1930s and has a history of leaks including the escape of 33,000 gallons of gasoline into Darby Creek near Philadelphia in June this year. 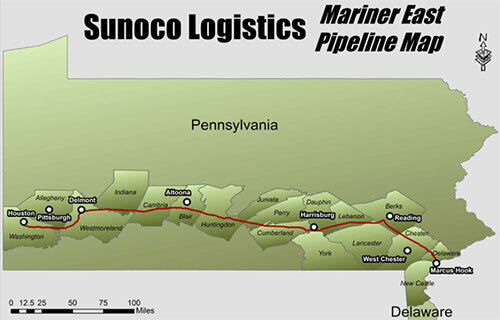 Sunoco and its parent company, Energy Transfer, had to utilize other sections of pipe to complete the Mariner East 2 after safety and environmental accidents delayed completion of the line through the Philadelphia suburbs. The complainants, four from Delaware County and three from Chester County, say they have standing to file the petition because they live within a few hundred feet of either ME1 or the “workaround” sections of the ME2 pipeline; have children who attend schools near the pipeline; live close enough that they might have to be evacuated in the event of a leak, and regularly travel on roads near both pipelines. Here’s a copy of the PUC filing. Editor’s Note: What’s especially interesting about this filing is the name of the lawyer representing the petitioners in this case. His name is Michael Bomstein. He has a very cozy relationship with the Clean Air Council. Indeed, his son Alex is Senior Litigator with the group, as Jim pointed out in this earlier post. Here’s a clip of him talking about some of his work for Mariner East opponents (he’s one of them, too, being a local NIMBY himself). So, what we have here is a family affair. The Clean Air Council has been a vicious opponent of the Mariner East projects and Michael Bomstein’s son just happens to work for them. 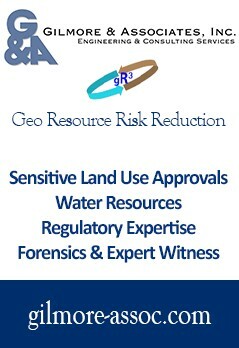 They’ve launched lawsuits together, in fact, against Mariner East. The latest lawsuit is just a continuation of that battle. And, look whose promoting it; StateImpactPA with the article excerpted above. Jon Hurdle, in fact, put out a 1,600 word piece embellishing the lawsuit every way he could on November 20 and, as of this morning, it’s still at the top of the heap on the StateImpactPA website. StateImpactPA, of course, is funded by two Haas family foundations and the Heinz Endowments. The Haas and Heinz families are Pennsylvania’s twin pillars of plutocracy; one representing Philadelphia and the other Pittsburgh. Not so coincidentally, they both also fund the Clean Air Council and Alex Bomstein’s job, as well as Jon Hurdle’s. And, Jon Hurdle just happens to decide he ought to pen 1,600 words extolling Alex’s father’s lawsuit. StateImpactPA.in fact, went so far as to say “Neither Heinz, nor any of StateImpact Pennsylvania’s other funders, nor any groups or organizations funded by the foundations Mr. Shepstone cites, have any say or influence over our news coverage.” That’s like running a store and wanting the gullible to believe you don’t pay any attention to the needs and wants of your best customer. It’s ludicrous on its face. What we see with this latest effort is one last coordinated effort by the shills for Haas and Heinz to squelch Mariner East projects. I do also and appreciate their efforts immensely. Is Josh Fox your cousin? Peace out Vera things are groovy, bang the bong and let the sunshine in, let’s kick down a cobblestone road and smoke from the Dakota Peace pipe, ahhnhh yes toke deep…hold it…hold it… slowly exhale keeping that bong tar deep within our lung tissue where it will stay for years…ahhh THC rush to the head, can you feel the highhhhhh? Now were ready… let’s go find a camera and tell them “couph couph hack hack” that we demand clean air were tuned…. hey does Kim Michaels have a cigarette, maybe I can get a cigar off Bills House mate.